The Jack Sack™: Which 24 Character Are You? You know, Adam, in a bizarre kinda sorta way, that actually makes sense. Okay, so take the test and let me know which character you are too! hahahhahahahahah Rickey is Audrey, Rickey is Audrey!! OK, now I'm totally frightened to take the test. I'll check back in later. 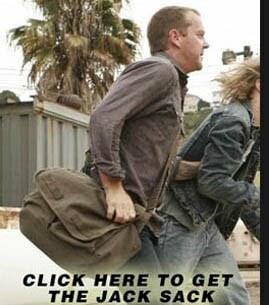 OK, I know no one is going to believe me, but I came up as Jack Bauer. Seriously. And I even gave several answers that I figured were going to make it impossible that I would come up as Jack. Probably what tipped the scales is that I'm really stubborn and, much to my own detriment at times, I'm liable to mouth off at a boss (or a boss' boss) when I think s/he's wrong. I have a few bosses who could testify to this. Some who took it well; others who, well, not so much. I'm amazed that so far, all of us are different characters. Amy, you ARE Jack. Totally. This is no laughing matter damnit! Audrey?! F**k! By the way, Rickey/Audrey - I'm leaving you for Kate Warner. Amy: Kate Warner? Much like Audrey at last season's finale, Rickey is traumatized. I'm still pretty hot! And by hot I mean smoldering following the car bomb incident. Why do I suddenly feel like Bill Buchannan? I loved ya, but it just didn't work out. It was Tony this, Tony that. I wanted you to be mine, but no, first you hadn't moved on, then I was too old for you. (even when I'd change my hair color, which would make me look 20 years younger. )It was never enough. And during all those times I slept with Karren Hayes, I thought only of you. Now you blew yourself up, and I decided to do the same. With all due respect, am I worthy of you now? Huh? huh?